David Myers is the founding director of the O’Pake Institute for Ethics, Leadership and Public Service at Alvernia University. “Five Questions with…” is a regular Keystone Crossroads feature where we seek to glean wisdom and ideas from some of Pennsylvania’s top urban thinkers and doers. David Myers is the founding director of the O’Pake Institute for Ethics, Leadership and Public Service at Alvernia University. Q: Tell us about an amenity or service that you’ve seen in your travels to other places that you wish you could bring back to your city/community. A: First, there are some pedestrian friendly public spaces that I have found particularly attractive and worth emulating — downtown Ithaca, N.Y.; the Grove Arcade in Ashville, N.C. and the Piazza at Schmidt’s in Philly. Second thing, would be recapturing the riverfront. 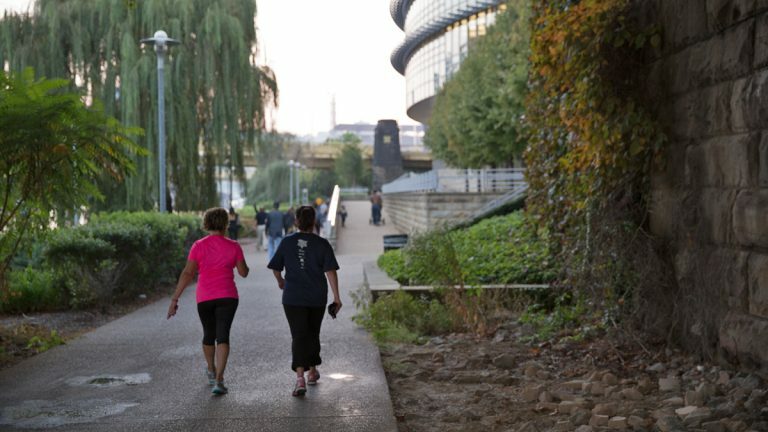 Harrisburg has a long history with an attractive riverfront, starting with the City Beautiful movement at the beginning of the 19th Century and more recently with improvements to the riverfront, connecting it with a greenway trail and developing City Island. Pittsburgh has done a great job in recent years of recapturing its riverfront. And Rochester, N.Y. and Greenville, S.C. have done some interesting stuff with their waterfronts. Manayunk is a good try, but they really haven’t recaptured the riverfront and integrated it into the neighborhood like these other places. Too many of Pennsylvania’s cities and towns turned their backs on the rivers. I’m also a fan of recycling old buildings into new uses. Bucknell helped revive downtown Lewisburg by repurposing or rehabbing several old buildings in the downtown without affecting the character of the town. And I’d guess I’d have to add, since I’m a fan of brewpubs, that I think by and large they can be a positive factor in revitalizing a downtown — as they have done in Ashville, in San Diego, in Lancaster and even in places like Selinsgrove and Danville. Q: What’s one urban improvement idea that you would categorize as “nice try but didn’t work”? A: First would be the generic, ubiquitous Convention Center idea — that if you build it they will come. Lancaster tried that with its convention center, which languished for years. Lancaster is now a pretty vibrant place, but it wasn’t because of the Convention Center. And closer to home, the Goggleworks in Reading. I’m a fan of the Goggleworks and everyone that I take there is impressed by it. But you have to search it out and you have to get inside to get a feeling of the place. It isn’t readily evident to people passing through. And none of the studio space or gallery space is evident from the street or even the parking lot. Q: Describe a person in your community who is a “spark” — someone who seems to get things done and inspire people. (This does not need to be an elected official.) A: Karen Rightmire of the Wyomissing Foundation. Karen is good at seeding things, focusing groups and targeting projects. There are others, but if I had to pick one it would be Karen. Q: What flaw or habit does your city/community have that you would like to see change? A: People give up too easily; they have the attitude “been there, tried it and it didn’t work.” That and waiting for someone else to lead, and looking for a magic bullet. Q: Tell us about a movie or book that depicts, in a way that grabbed your attention, how a city can thrive or fail. A: Tracy Kidder’s “Home Town.” We lived in Northampton before it’s revival. And Kidder’s book is about common people as well as the transformation of a community. Is there someone you know who thinks hard about cities and knows how to get things done? Someone whom Keystone Crossroads should spend “Five Questions with …?” Please let us know in the comment sections below or via Facebook or Twitter @Pacrossroads.